I am designing a consumer app for enhancing a museum visit. At the entrance users can use the Augmented Reality functionality to frame the exhibition poster and see a video overlay. How do you design a call to action in the homepage to drive users to use the AR function? As mentioned in the comments, one common way to demonstrate a virtual and real crossover capacity is barcodes. However that's not entirely without cost because you'll have to redo all the posters and wall art to include the barcodes, and they'll steal from or otherwise diminish the aesthetics of the posters. Instead, digitised images (photos!) of the posters, with a strong priority given to the first poster they're likely to see on entrance, as buttons/windows to the AR experience, might be the best possible "clean" solution. Sequence and weight these images of the posters as a well organised array of buttons with a simple scrolling mechanism and you might also wind up encouraging visitors to more deeply explore and discover the extent of the museum. It's recommended that you only have one CTA per page. Your homepage has 3. So it will be understandable if the user doesn't do what you expect them to do at this stage. I think you need to create a clear, guided experience for the user - that typically requires one CTA per screen. If the AR function is to be used with the exhibition poster - you need to surface this option at the right time and ensure your provide enough instruction to the user. If you can't label this CTA to be self-explanatory provide some on screen text alongside it so that the user knows when they can use it. You don't want the user to miss the opportunity to use this feature. Not the answer you're looking for? Browse other questions tagged mobile-application call-to-action augmented-reality cta or ask your own question. 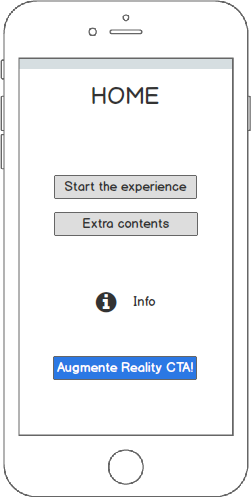 Mobile Augmented Reality App. What pattern for AR visualization and navigation? How detailed can/should I go with the Android OS in terms of design? How to avoid opening a dialog from within a dialog?